In this webcast, we provide an overview of our complete end-to-end clinical stack. Initially, we walk through our powerful secondary analysis pipeline which allows you to call SNVs and CNVs. We then demonstrate how various types of CNVs are called and discuss metrics that express the confidence associated with each call. From there, we show you our powerful tertiary analysis capabilities for gene panels, exome and whole genome data. We show how our users can move seamlessly from the variant interpretation stage to a clinical report. Lastly, we demonstrate how our genetic data warehouse, VSWarehouse, can be used in the clinic. We also demonstrate various use cases and show how a comprehensive assessment catalogue can be utilized to ensure consistent analysis across multiple labs. 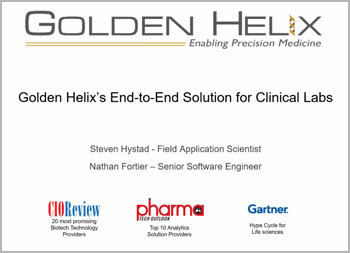 We hope you enjoy our first presentation on Golden Helix's entire end-to-end solution for clinical labs! Nathan Fortier joined the Golden Helix development team in June of 2014 and is a Senior Software Engineer and Field Application Scientist. 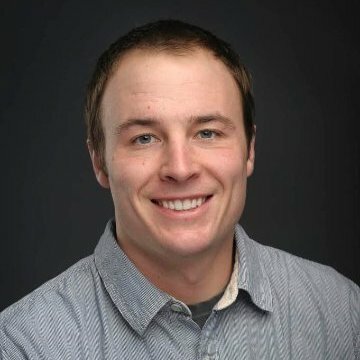 Nathan obtained his Bachelor’s degree in Software Engineering from Montana Tech University in May 2011 and received a Master’s degree as well as a PhD in Computer Science from Montana State University. Nathan works on data curation, script development, and product code. When not working, Nathan enjoys hiking and playing music.